Effective May 2015, the Florida Department of Health now requires all Florida healthcare professionals to provide proof of CE compliance at the time of renewal. This means that your continuing education course completions MUST be reported to CE Broker BEFORE you will be allowed to renew your license. Getting started early is now more important than ever. 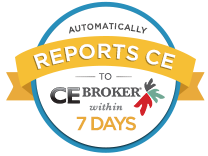 Taking courses through approved providers who report to CE Broker in a timely fashion is the easiest way to ensure you will be ready to renew on time. Professional Development Resources reports all courses to CE Broker within one week of completion. This entry was posted in CE Broker and tagged CE, CE Broker, CEUs, continuing education, Florida CE Broker, Florida CE tracking system, Florida CEUs, Florida Department of Health CE Compliance, Online Courses, Professional Development Resources by Gina Gunderson. Bookmark the permalink.